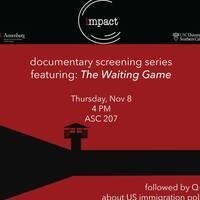 Join us for a screening of The Waiting Game, a student-produced documentary that takes a look at immigration policy in the US through the story of a family struggling to stay together. We follow a former detainee as he tells of his dream to build a life in California as well as his detention at the Adelanto ICE Processing Center, one of the biggest privately-owned immigrant holding facilities as well as one of the most controversial. The screening will be followed by a Q+A with the producers of the film, a former detainee, and an immigration expert.